UU A Way Of Life: From what do things arise? From what do things arise? It is called the Ground of Being. Luke Skywalker called it "The Force." Tao gives rise to form but form is not Tao. Form is the manifestation of Tao for without Tao from what would form arise? In A Course Of Miracles, it is taught that form arises from separation. Projections are illusions and are no more real than dreams. Reality is the Oneness which is Divine Mystery. We are part of the All. 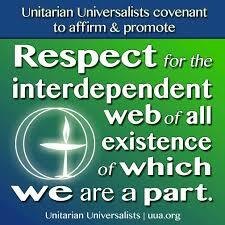 Unitarian Univeralists call the Oneness, the All, the Divine Mystery, the "interdependent web of all existence." Like all religions which have the perennial psychology in common, Unitarian Univeralists are on to something.